As Spotify marks the one-year anniversary of its IPO, new data from YouGov Plan and Track shows that consumer perception of the brand has remained relatively steady since last April, when the company went public. Among US adults who report using the audio service at least once per week (“Spotify Users”), however, overall impression rates began to drop in early February following news that Spotify would ban consumers who used ad blockers. According to additional YouGov numbers, 59% of Spotify users employ an ad blocker when surfing the internet. 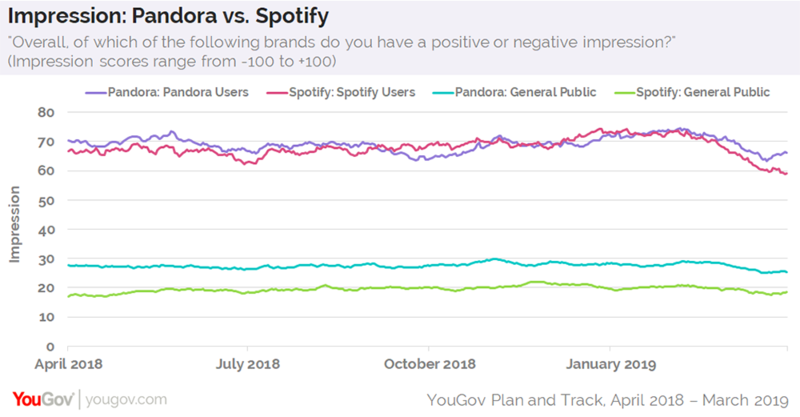 Meanwhile, figures reveal that both the general public and consumers who use rival service Pandora at least once per week (“Pandora Users”) have maintained a fairly consistent view of Pandora over the past year. Indeed, Pandora has averaged a higher Impression score (+28) throughout the past year among all US adults ages 18+ than Spotify (+20). At the same time, fewer Pandora users (52%) report employing an ad blocker when browsing online. In recent months, both brands have been turning to podcasts to help boost their profits. 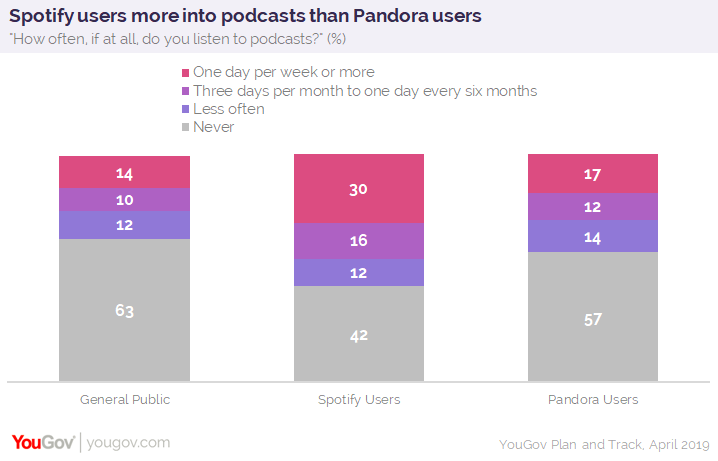 YouGov data suggests Spotify might have an edge here, as 30% of Spotify users say they listen to a podcast at least once per week, compared to 17% of Pandora users who report the same. Overall, the majority of regular Pandora users (57%) say they never listen to podcasts. For Spotify users, the opposite is true: the majority (58%) report listening to podcasts at least occasionally. Further numbers show that 66% of Spotify users find it frustrating when music gets released exclusively through one platform or service, compared to 53% of Pandora users. Also, 41% of Spotify users sometimes feel overwhelmed by the amount of music available, compared to 33% of Pandora users. In total, consumers who use Spotify at least once per week tend to be younger than consumers who use Pandora at least once per week: 82% of Spotify users are between the ages of 18-49; 66% of Pandora users fall within the same age range.